Young Amber lives with his mother, a back alley prostitute somewhere in the Philippines. He's subjected to daily abuse at the hands of the local kids and his teacher because he doesn't have a 'real' father, but one day, a kindly police officer adopts Amber and his mother and the new 'family' enjoys a modicum of domestic bliss. Alas, their happiness is only temporary, and after an unfortunate misunderstanding, Amber's new dad ends up dead. Flash forward ten years, and Amber is now a mustachioed small time hood--played by an actor who looks nothing like the child actor from the first reel--and his mother, crazed with grief, has been institutionalised. Amber is eager to make it big, and he accepts an assignment to assassinate a wheelchair bound gangland competitor. Having proved his worth by manfully killing a cripple, Amber moves on to bigger things and must confront Martinez, a man who controls a heavily armed army of black clad ninjas. 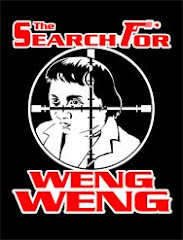 Ostensibly a Hong Kong production, the credited cast and crew of this low budget action feature is entirely Filipino. 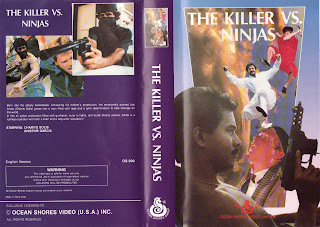 Ocean Shores video bears a 1989 copyright date and judging from the clothing and hairstyles, the film (titled The Killer vs. the Ninja on the tape) was almost certainly shot sometime in the Big 80s. There's an anachronistic disco scene to muddy the waters, however, so it's hard to pin down an exact production date. The confusing pre-credits sequence is a highlight reel of what follows, so unless you have a particular interest in the ups and downs of Amber's life, you'll have seen most of the good stuff in the first five minutes.